Free Seminar “What Does My Insurance Cover for Long Term Care?" The Village at Cedar Hill is pleased to host the next free seminar in their popular Speaker Series: “What Does My Insurance Cover for Long Term Care?” presented by Denise Vanguilder, Director of Financial Services at Cedar Hill Continuing Care Community. Confused about health insurance? The health insurance marketplace can be bewildering, especially as it pertains to nursing home, rehab, memory care, and assisted living coverage. At this seminar we will answer some of your most-asked questions about health insurance coverage at Cedar Hill. Medicare A and Medicare B in the LongTerm Continuing Care Community – What is the difference and what does each cover? What are Medicare Advantage Plans and are they right for you? Do I need a Medicare D Plan? Supplemental insurance: Is it worth the monthly premium? Long Term Care Insurance: What does it actually pay for? Ms. Vanguilder has been working in long term care facilities since 1993. She has a great deal of experience in a vast array of long term care financial services including billing for inpatient stays, assisting families with Medicaid applications, submitting claims to long term care insurance companies, and help with home care claims for assisted living residents. Presently, Ms. Vanguilder is responsible for all financial services at the Cedar Hill Continuing Care Community including the skilled nursing facility, assisted living, and memory care. Tuesday, February 23 at 10:00am. The Village at Cedar Hill Speaker Series will continue throughout 2016, with presentations on Alzheimer’s, Diabetes, Parkinson’s Disease, and Nutrition & Wellness in the coming months. 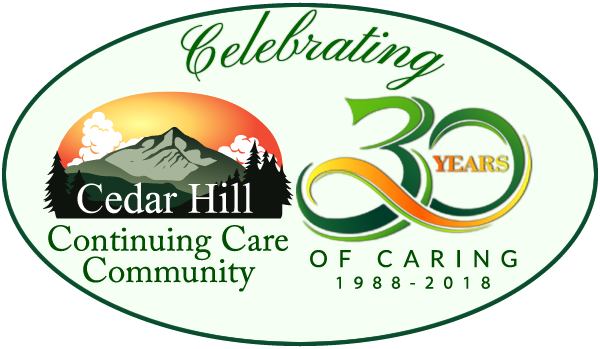 Cedar Hill Continuing Care Community comprises Cedar Hill Healthcare and the Village at Cedar Hill. A family-owned & operated senior community, providing a supportive and comfortable home to seniors in all stages of life, Cedar Hill was founded in 1988 by Mary Louise Sayles, a registered nurse and licensed nursing home administrator with many years of experience in long term care administration. Mary Louise’s daughter Patricia Horn, who is also a licensed nursing home administrator, is currently the Community Administrator.